After the short first competition day the ASBC Asian Confederation Boxing Championships continued with a bit longer preliminary program in Bangkok, Thailand. Kazakhstanâ€™s Temirtas Zhussupov arrived to the venue as the defending champion of the Light Flyweight class (49 kg) as he won the last edition in Amman, Jordan two years ago. The 27-year-old boxer had to meet with Sri Lankaâ€™s newcomer Thiwanka Palleha Muturanwellige and his efforts were enough to beat his South Asian rival but his opening performance was not his best ever one. The Sri Lankan boxer had great fighting spirit but his experiences were much less than his Kazakh opponent. Vietnamâ€™s Southeast Asian Games silver medallist Huynh Ngoc Tan also started his participation in the Laosâ€™ AIBA Youth World Boxing Championships competitor Khamphouvanh Khamsathone who will be turning to 19 only later. The Vietnamese boxer dominated their contests while the boxer from Laos was still too inexperienced with less 30 bouts to be a competitive rival for Huynh in Bangkok. His triumph is Vietnamâ€™s second one in the ASBC Asian Confederation Boxing Championships. Iraqâ€™s Hasan Ali Naser was involved to the national team in 2010 and took part in several international events in the recent years and fought bravely against DPR Koreaâ€™s Ham Jong Hyok in Bangkok. The 20-year-old North Korean boxer kept the distance against his opponent and his height advantage was too difficult for the Iraqi hope who tried to attacked from the first seconds in their contest. In the fourth bout in the category Syriaâ€™s five-times National Champion Hussin Al-Masri and Pakistanâ€™s Mohibullah Bacha did a manly fight and had good rhythm with a lot of punches but only some of them reached the target areas. The Pakistani veteran had great attacks in the middle part of the bout but the Syrian boxer was enough fresh to control the contest in the final round which delivered for him a clear triumph. Philippinesâ€™ Mario Fernandez was gold medallist in the Southeast Asian Games in Singapore and secured bronze last year at the Incheon 2014 Asian Games. His first opponent was Iranâ€™s Fajr Tournament winner Reza Korzbori who surprised the Filipino ringside with his powerful attacks. Fernandez was patient in the opening round while he raised the rhythm in the second three minutes and that was the difference between them. Korzbori was a bit tired in the final round but his stamina was excellent in their tight bout which was won by Fernandez. Japanâ€™s ASBC Asian Confederation Boxing Championships bronze medallist Kenji Fujita also began his road to the medal anticipated the medal contests in Bangkok. He was quicker and had more punches than his opening opponent Sri Lankaâ€™s strong Gayan Sanjeewa Jayaweera Naiduralage. The Japanese southpaw also controlled the second round using his great footwork in the middle part of the bout. The Sri Lankan boxer found the best fighting distance in the final round while Fujita tried to keep power for later actions but his triumph was not in danger in their preliminary bout. Mongoliaâ€™s Iderkhuu Enkhjargal is a very experienced boxer in the international level who competed in several events since 2006. The multiple international tournament winner replaced London 2012 Olympic Games silver medallist Tugstsogt Nyambayar in the team this year. Iderkhuu had some great punches against DPR Koreaâ€™s Cha Kil Yong in the opening round but his rival was also accurate in the later part of the bout. Their contest was a really tight one but finally Iderkhuuâ€™s hand was raised. Chinaâ€™s WSB boxer Wang Long was the favourite in the preliminary bout against Iraqâ€™s 19-year-old Jaafar Abdulredha Ali Al-Sudani. His taller Iraqi opponent who had some good youth results in the international tournaments came from a boxing family as his elder brother is also here in Bangkok. Al-Sudani received a warning from the Romanian referee and in spite of his height advantage he wanted to fight with the Chinese boxer. Al-Sudani had great fighting spirit and tried to control the bout until the final seconds and despite of the warning he could eliminate his Chinese rival in Bangkok. Turkmenistanâ€™s Duisenkul Shopokov Memorial Tournament bronze medallist Yakub Meredov had a great youth career while now he is enough strong to get good results in the elite level as well. The 22-year-old Central Asian boxer had to meet with Qatarâ€™s Othman Jumani Arbabi who competed at the Doha 2006 Asian Games but returned to the world of boxing last year. The Turkmen boxer dominated the opening round with his great combinations but following that he reduced the speed of the bout. Meredov played a bit in the second round and some of his right jabs were really dangerous for the Qatari boxer. Nepalâ€™s Dinesh Shrestha is a veteran boxer who competed in several international competitions including the Incheon 2014 Asian Games therefore he was the favourite against Laosâ€™ Chansamone Vilaysack who is an athlete from their new generation. The Bantamweight class boxer was not enough accurate in the middle part of the bout but his coach Om Maskey gave him good instructions in the ringside after the second round therefore he could win their contest with his great combinations in the last three minutes. 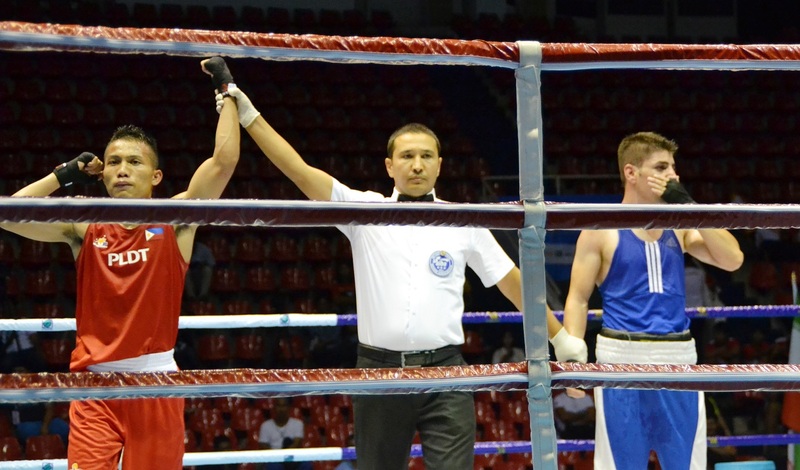 Tajikistanâ€™s Asror Vohidov was gold medallist at the 2011 AIBA Junior World Boxing Championships in Astana and claimed bronze at the 2012 AIBA Asian Olympic Qualifiers. Since then he moved up two weight classes but his style did not change, tried to find the best moments to become faster than his opponents. He had a very experienced rival, Mohammed Abdelaziz Al-Wadi who was bronze medallist at the 2011 ASBC Asian Confederation Boxing Championships. Vohidov controlled the first round but he received a warning from the referee and another one in the second three minutes therefore finally Al-Wadiâ€™s hand was raised. Vietnamâ€™s boxing life turned into a new era when their boxers ranked as second in the Southeast Asian Games in Singapore. Tran Phu Cuong is competing in his first ever Asian Championships but his footwork and rhythm was enough to keep the level of the event. The Vietnamese boxer controlled the first round against Chinese Taipeiâ€™s Lin Sheng Lin but his opponent had enough power to step into the gas. The defense of the boxers was not world class but their fighting spirit was really excellent in their manly contest. The hectic contest finished with Vietnamese victory. Uzbekistanâ€™s AIBA Youth World Boxing Championships silver medallist Murodjon Akhmadaliyev was in different level than his opening opponent Bangdaleshâ€™s Mohammed Omiduzzaman. The referee counted the Bangladeshi boxer in the opening round and his lethal hooks reached the target several time. Akhmadaliyev had great uppercuts also in the second round therefore the Sri Lankan referee counted Omiduzzaman once again. The Uzbek boxer dominated the final round and advanced to the last 16 in Bangkok. The continental competition will be continued with its third preliminary day tomorrow when also thirteen bouts will be held in Bangkok in four different weight classes.